Here's awesome classic pickup truck manufactured by Chevrolet. As the picture is the Chevy 3100 short bed released in 1952 has been fully restored powered by younger rebuilt engine with 50 miles on it. All looks awesome, it is worth to considering as a perfect collection. The pics as confirm, it looks so nice and all in perfect condition. The photo has represented the words, you just need to prove it, come to see itself is a good decision. 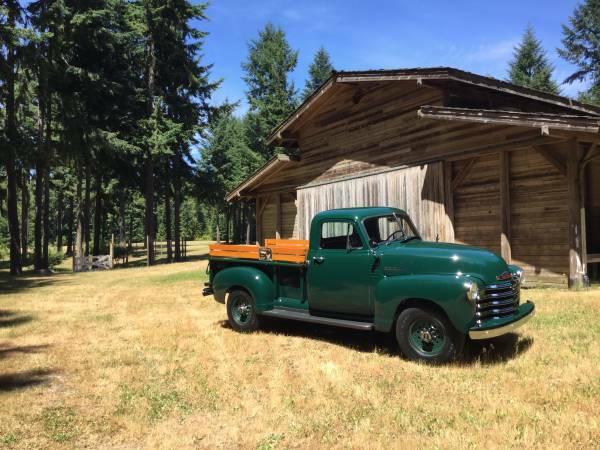 Overall it very nice finished of the 1952 Chevy 3100 restoration project, asking $28000 location in Vashon island. 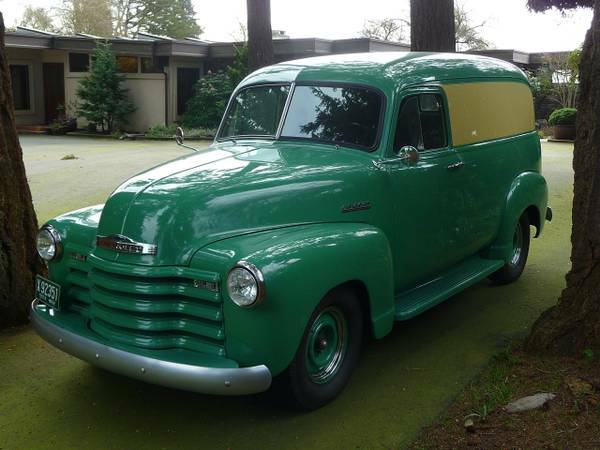 1952 Chevy Panel Delivery truck, locally owned since new. Lots of new parts , kept stock for the most part. Refurbished 2006, new dash gauges, lowered 2 inches with new leaf springs and shocks, two tone original color paint for 1952. New rubber parts everywhere and flat glass, Automatic transmition, 3oo + cid straight 6 cyl motor. Power disc brakes in front. Runs and drives like a 1952 truck, Just stops alot better. Runs and drives as is. Needs an interior,and wiring update to finish, which is really all the fun stuff. Here's we found the slammed American classic truck on excellent condition, ready for new owner. 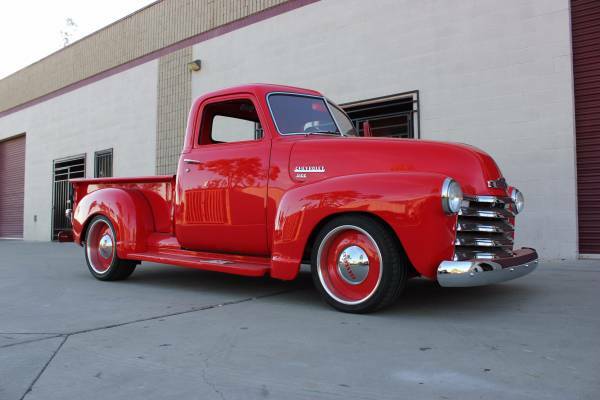 This 1949 Chevy 5 window pickup is the result of a complete frame-off a three-year build. The laser-straight body is covered by a Porches red paint. All new trim and chrome give the body a little extra shine. The undercarriage is equally as nice as the body. The highly detailed frame features independent front suspension with power rack & pinion steering. 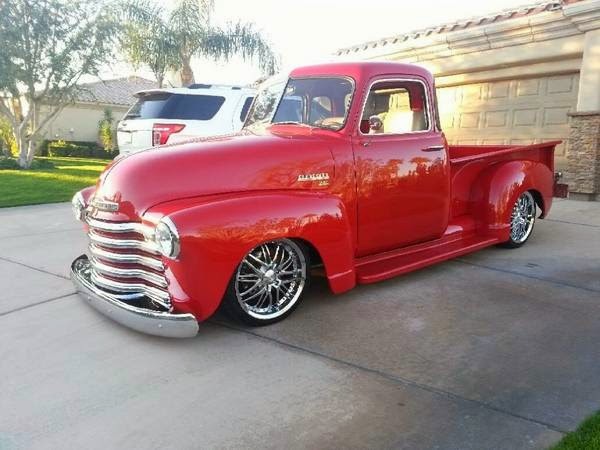 The rear was built with a Chevy 10-bolt rear and Air Ride Technologies front and back airbag system giving the truck its great ride and slammed stance. Front power disc brakes have plenty of strength to stop this beauty. The fresh 350 crate and turbo 350 allows for a nice cruise. The cream leather interior features a custom seat and console that houses Vintage Air heat and air conditioning controls and a custom stereo. A tilt column with a billet leather wrapped steering wheel, and a custom leather headliner also highlight the exceptional interior. The truck rides on a set of ZR1 type wheel. The fuel cell was moved to the rear of the truck under the oak floor bed with stainless strips. Absolutely no detail has been overlooked on this incredible Chevy. This fresh truck has less than 500 miles on it since its completion and has never been shown on any circuit major venue. This gorgeous Chevy was built to the absolute to be enjoyed as a show truck and an awesome cruiser. 1950 Chevy 3100 Truck Here's we found American classic truck on red metal, very attractive and clean condition. 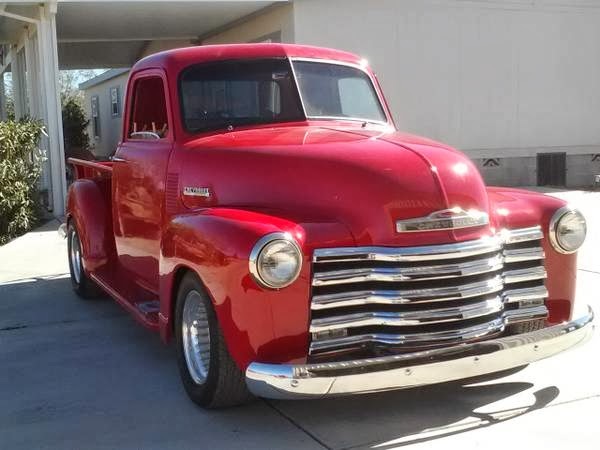 This truck has fully restored, for sale in Tucson Arizona. Ready for new owner and new home.